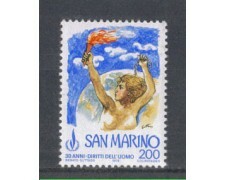 1978 SAN MARINO - Virtu' Civili (Cat. Unif/Sassone N° 1009/1011) serie completa di 3 valori Nuovi gomma integra in quartine. 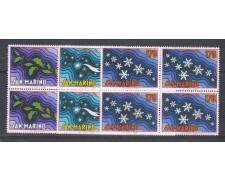 1978 San Marino - Virtue civilians - complete set of 3 stamps MNH New Original - block of four. 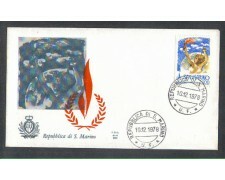 1978 SAN MARINO - Europa Monumenti (Cat. Unif/Sassone N° 100071001 - Yvert N° 955/956) Serie completa di 2 valori Nuovi gomma integra in quartine. 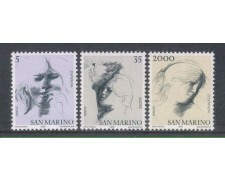 1978 San Marino - Monuments Europe - new complete set of 2 values ​​MNH - Block of four. 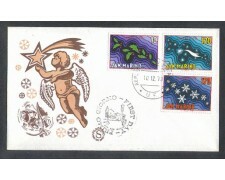 1978 - SAN MARINO - NATALE (UNIF.SASS. 1013/1015) FDC (FILAGRANO). 1978 - SAN MARINO - NATALE (UNIF.SASS.1013/1015) SERIE COMPLETA 3v. IN QUARTINE NUOVE GOMMA INTEGRA ORIGINALE. 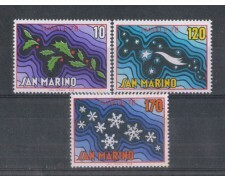 1978 - SAN MARINO - NATALE (UNIF.SASS.1013/015) SERIE COMPLETA 3v. NUOVI GOMMA INTEGRA ORIGINALE. 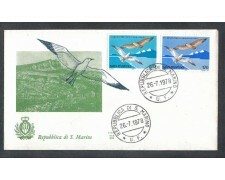 1978 - SAN MARINO - 30° ANNIV. 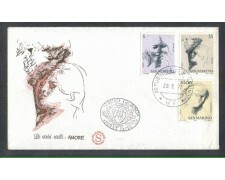 DELLA DICHIARAZIONE DEI DIRITTI DELL'UOMO (UNIF/SASS.1012) FDC (FILAGRANO). 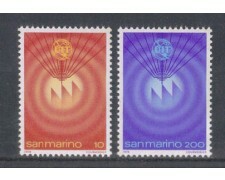 1978 - SAN MARINO - 30° ANNIV. 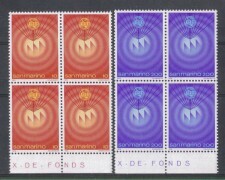 DELLA DICHIARAZIONE DEI DIRITTI DELL'UOMO (UNIF/SASS.1012) FDC (ALA). 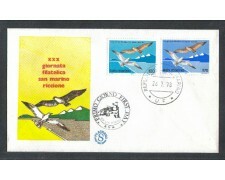 1978 - SAN MARINO - 30° ANNIVERSARIO DELLA DICHIARAZIONE DEI DIRITTI DELL'UOMO (UNIF/SASS.1012) QUARTINA NUOVA GOMMA INTEGRA ORIGINALE. 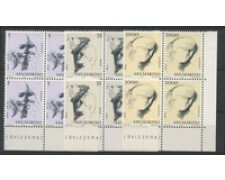 1978 - SAN MARINO - 30° ANNIVERSARIO DELLA DICHIARAZIONE DEI DIRITTI DELL'UOMO (UNIF/SASS.1012) NUOVO GOMMA INTEGRA ORIGINALE. 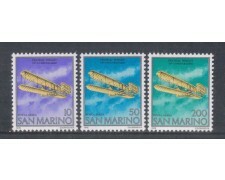 1978 - SAN MARINO - 75° ANNIVERSARIO DEL PRIMO VOLO DEI FRATELLI WRIGHT (UNIF.SASS. 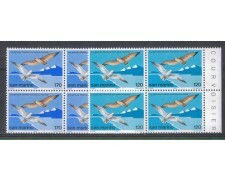 A155/157) POSTA AEREA SERIE COMPLETA 3v. NUOVI GOMMA INTEGRA ORIGINALE. 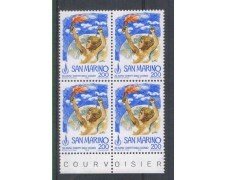 1978 - SAN MARINO - VIRTU' CIVILI 3° SERIE (UNIF.SASS. 1009/011) FDC (ALA). 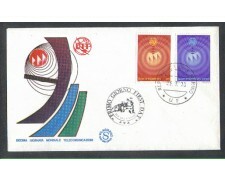 1978 - SAN MARINO - VIRTU' CIVILI 3° SERIE (UNIF.SASS.1009/011) FDC (FILAGRANO). 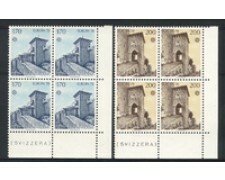 1978 - SAN MARINO - VIRTU' CIVILI 3° SERIE (UNIF.SASS.1009/011 - YVERT.964/966) SERIE COMPLETA 3v. NUOVI GOMMA INTEGRA ORIGINALE. 1978 - SAN MARINO - INGRESSO DI SAN MARINO NELL' U.I.T. (UNIF. 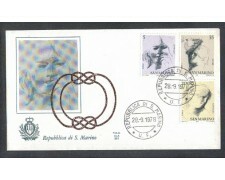 SASS.1007/08) FDC (ALA). 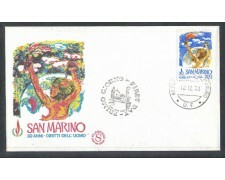 1978 - SAN MARINO - INGRESSO DI SAN MARINO NELL'U.I.T (UNIF.SASS.1007/08) FDC (FILAGRANO). 1978 - SAN MARINO - INGRESSO DI SAN MARINO NELL'U.I.T (UNIF.SASS.1007/08) SERIE COMPLETA 2v. IN QUARTINE NUOVE GOMMA INTEGRA ORIGINALE. 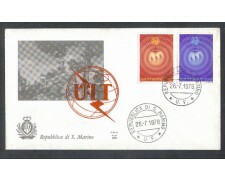 1978 - LOTTO/7987 - SAN MARINO - INGRESSO U.I.T. 1978 - SAN MARINO - INGRESSO DI SAN MARINO NELL'UIT (UNIF.SASS.1007/1008) SERIE COMPLETA 2v. NUOVI GOMMA INTEGRA ORIGINALE. 1978 - SAN MARINO - 30° GIORNATA FILATELICA SAN MARINO/RICCIONE (UNIF.SASS.1005/06) FDC (ALA). 1978 - SAN MARINO - 30° GIORNATA FILATELICA SAN MARINO/RICCIONE (UNIF.SASS.1005/06) FDC (FILAGRANO). 1978 - SAN MARINO - 30° GIORNATA FILATELICA SAN MARINO/RICCIONE (UNIF.SASS.1005/006) SERIE COMPLETA 2v. IN QUARTINE NUOVE GOMMA INTEGRA ORIGINALE.